In a medium microwave safe bowl, melt butter and chocolate chips in the microwave for about a minute or until melted. Stir together until combined. Add crispy rice cereal and stir well to coat. Press into the bottom and up the sides of a 9-inch springform pan. You could use a pie pan but I've found that a springform pan is much easier when it comes to removing slices. Place in the freezer to chill while you make the filling (about 10 minutes). In a large bowl beat cream cheese until fluffy. Add the sweetened condensed milk and peanut butter and mix until thoroughly combined. Add vanilla and lemon juice and mix until combined. Gently fold in the whipped topping. Pour filling into the prepared crust. Heat fudge and peanut butter in two small separate bowls for 20-30 seconds or until warm. Drizzle over filling. Freeze for 4-6 hours or until pie is firm. Remove the cheesecake from the freezer about 10 minutes before serving to make cutting easier. Garnish with peanut butter and chocolate candy bars. For all of those chocolate and peanut butter lovers, this cheesecake is for you! I’m convinced the devil himself arranged the marriage between chocolate and peanut butter because no other duo is so powerfully tempting. Whether it’s sneaking a spoonful of peanut butter sprinkled with chocolate chips hidden in the pantry closet or claiming the Oreos just happened to fall into the peanut butter container, I find a way every day to make room for some chocolate and peanut butter in my life. This Frozen Peanut Butter Cheesecake was actually intended for a get together at my friend’s house…but it didn’t quite make it there. I couldn’t let it go. All of that peanut butter and chocolate goodness had to stay with me. And the fact that I snuck a piece out of the cheesecake to taste it further convinced me that I had to bring Plan B to my friend’s house. I couldn’t take a partially eaten cheesecake to a party (or at least that’s what I told myself)! 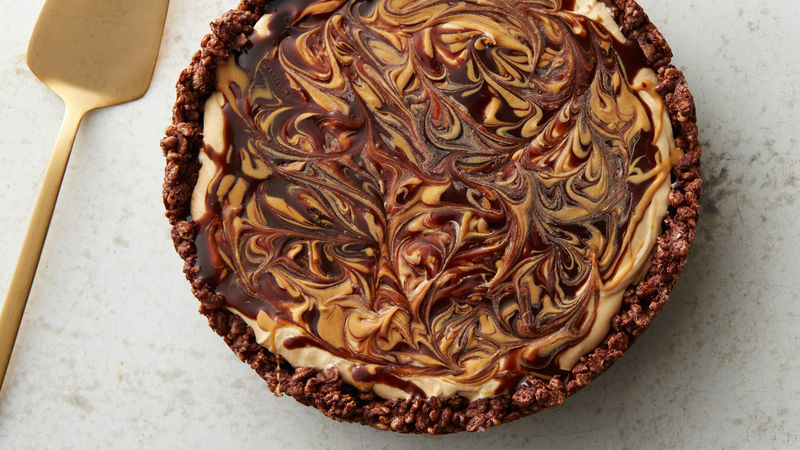 This dessert starts off with a crispy chocolate crust covered with a creamy peanut butter cheesecake filling and drizzled with warm peanut butter and chocolate on top. And get this…it’s frozen. Yep. No need to heat your house up for an hour with a blazing oven and no worrying about those pesky cracks that can inevitable destroy your self confidence and the aesthetic appeal of your cheesecake. This cool, creamy cheesecake is refreshing and forgiving. I’ve been sinfully indulging in this cheesecake for days. Hey, I can always repent tomorrow.